Abstract: The interplay between superconductivity and magnetism is one of the oldest enigmas in physics. Usually, the strong exchange field of ferromagnet suppresses singlet superconductivity via the paramagnetic effect. In EuFe2(As0.79P0.21)2, a material that becomes not only superconducting at 24.2 K but also ferromagnetic below 19 K, the coexistence of the two antagonistic phenomena becomes possible because of the unusually weak exchange field produced by the Eu subsystem. 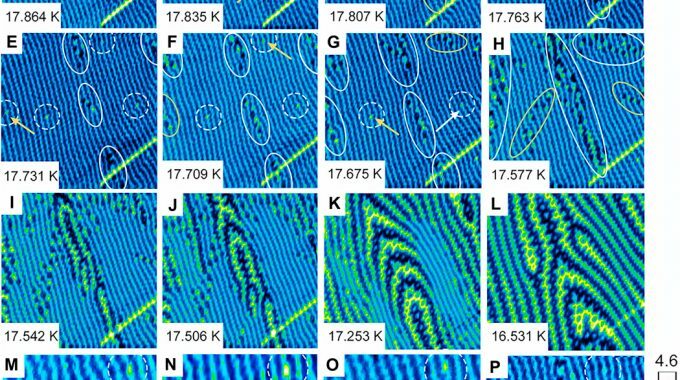 We demonstrate experimentally and theoretically that when the ferromagnetism adds to superconductivity, the Meissner state becomes spontaneously inhomogeneous, characterized by a nanometer-scale striped domain structure. At yet lower temperature and without any externally applied magnetic field, the system locally generates quantum vortex-antivortex pairs and undergoes a phase transition into a domain vortex-antivortex state characterized by much larger domains and peculiar Turing-like patterns. We develop a quantitative theory of this phenomenon and put forth a new way to realize superconducting superlattices and control the vortex motion in ferromagnetic superconductors by tuning magnetic domains—unprecedented opportunity to consider for advanced superconducting hybrids.